Studies in Christian-Jewish Relations is the journal of the Council of Centers on Jewish-Christian Relations and is published by the Center for Christian-Jewish Learning at Boston College. The Journal publishes peer-reviewed scholarship on the history, theology, and contemporary realities of Jewish-Christian relations and reviews new materials in the field. The Journal also provides a vehicle for exchange of information, cooperation, and mutual enrichment in the field of Christian-Jewish studies and relations. The Journal may be accessed freely on the internet. Please visit the Studies in Christian-Jewish Relations website at www.bc.edu/scjr. 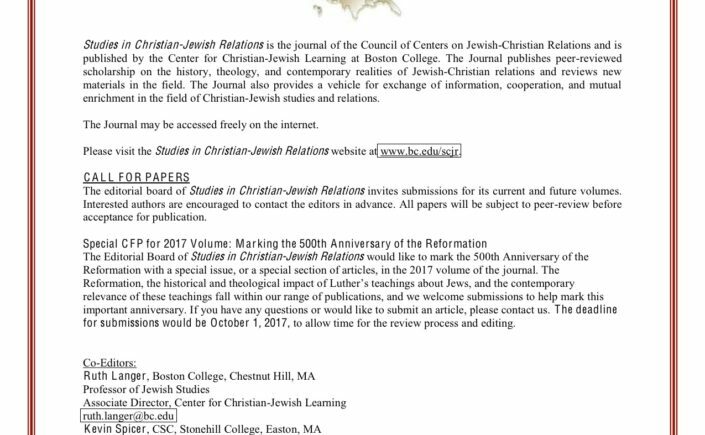 The editorial board of Studies in Christian-Jewish Relations invites submissions for its current and future volumes. Interested authors are encouraged to contact the editors in advance. All papers will be subject to peer-review before acceptance for publication. The Editorial Board of Studies in Christian-Jewish Relations would like to mark the 500th Anniversary of the Reformation with a special issue, or a special section of articles, in the 2017 volume of the journal. The Reformation, the historical and theological impact of Luther’s teachings about Jews, and the contemporary relevance of these teachings fall within our range of publications, and we welcome submissions to help mark this important anniversary. If you have any questions or would like to submit an article, please contact us. The deadline for submissions would be October 1, 2017, to allow time for the review process and editing.